This falls into the category of a simple little solution to make an every day "to-do" just a notch easier. It's a bin full of lunch-making essentials: napkins, spoons, thermos, baggies, brown lunch bags, peanut butter, bread, crackers and other small snacks. This little gem, simple and "weird" as it may be to blog about, saves time. Everything you need to make lunch ... in arms reach. Love that. Have I told you about my friend the storage bin label? I love these labels. I use a printed template --- so I can pick the font and color. It makes nice, big, easy to read, reusable labels. Fun, isn't it? You can find them at Wal-Mart ... sometimes. Due to my complete love of this product, and the inability to reliably find it at Wal-Mart, we carry them in our store. The uses for these little gems is endless! So ... it's a quick, simple easy project that will save you time each and every day. Have fun! I do something similar for my kids but don't keep it in a cute little container (if I had the room I would though!). 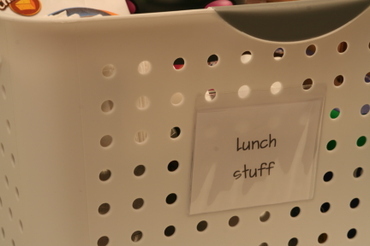 I've got a dedicated shelf for specific lunch stuff... and a whole other shelf for chips. :-) Those labels are great! Wow, what great ideas...I love that! Being prepared makes the mundane task of making lunches so much better! 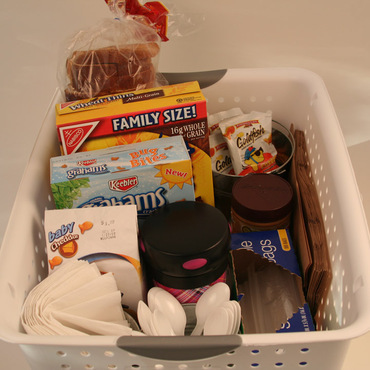 Do you keep the large basket in your pantry? Wow, I'm going to try some of these ideas this weekend...thanks! And, congrats on the new life change...how exciting and uplifting...it has truly inspired me to step out of my own comfort zone and take chances! My daughter buys her lunch at school, but I have to pack her snack. I did great at remembering last year, but for some reason this year, I have forgotten to send her snack bag out the door with her. I do have a special bin put up high for just the snacks for her to take (that way they don't get eaten up through the day) and we put her juices in the freezer so they will be thawed by the time she has snack. Now, I think I should go ahead and have the bags packed, ready to go, minus putting the frozen drink in. then I shouldn't have the problem of forgetting. Thanks! And best of luck on "taking the leap". It has got to be scary, but I'm sure it will work out well for you. I pack my lunch every evening while I'm preparing our supper. I have exactly the same container with my lunch stuff in my cabinet! It's new for me this school year and has already saved SO much time in the mornings! This is such a great idea - I just need to get myself some big storgage bins. Never seen so many comments about a lunch box, lol. Good on you for doing it!